Rudhyar believes that Western culture has made us aware of mankind as a whole, but that the Western emphasis on individual power and possessiveness has failed to give a human attitude adequate for the new global era. Indeed he often says that Western civilization is perhaps in a process of destroying itself. What he feels is now needed is a change in the total attitude of human beings: a devotion to the total man working in an organic relation to social processes. It is an attitude that transcends the opposition of the individual and the social; in one place he calls this "organic individualism." The "unity" of mankind is not to negate differences of the various regions of the earth and all varieties of human temperament. Two characteristics of Dane Rudhyar which separate him for many who hold positions similar to the above, are the following: 1) while he is sympathetic to moderate sized communities, he is critical of small social groups which only project the leader’s personality; 2) he does not seduce his readers by predicting a utopian Golden Age just around the corner. He is aware of difficulties and perhaps even catastrophes. What he stresses is the need of "seed groups" which are open to change and which repudiate possessiveness in the service of a new age of "interdependence and synthesis." During the summer of 1974 Rudhyar met Leyla Raël, with whom he had corresponded for several months. Later that year she began living and working with Rudhyar and Tana in Southern California. In 1976 Rudhyar and Tana divorced, and Rudhyar and Leyla took residence in Palo Alto, California. They married on 31 March 1977. Thus began, at age eighty, perhaps the most creative and productive period of Rudhyar’s long life. Rudhyar soon began a long and fruitful phase of composition, giving rise to the long piano works Transmutation, Theurgy, Autumn, Three Cantod, Epic Poem and Rites of Transcendence, as well as the reworking and orchestration of older work. During the early 1980s Leyla’s sustenance and the secretarial assistance of Joseph Jacobs allowed Rudhyar to conduct a busy schedule of lecturing, writing and composing. During these years he produced some of his best and most significant written works, including The Rhythm of Wholeness, The Astrology of Transformation, Beyond Individualism, The Magic of Tone and the Art of Music and The Fullness of Human Experience. A symposium was held in his honor at California State University, Long Beach during his eighty-first birthday. In 1976 and 1977 he received grants from the National Endowment for the Arts, and in 1978 he received the Peabody Award. A concert of the League of Composers-International Society for Contemporary Music in New York was performed for his eighty-fifth birthday. On 10 March 1982, selections of Rudhyar’s music was performed as part of the American Composers Series at the John F. Kennedy Center for the Performing Arts in Washington, DC. 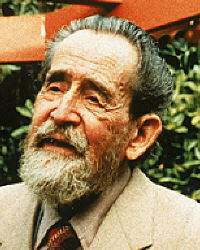 During 1981 the Rudhyar Institute for Transpersonal Activity (RITA) was incorporated by Leyla Raël. The first of two RITA conferences was held in Menlo Park, California during September 1983. A second conference was conducted at the same location in celebration of Rudhyar’s ninetieth birthday. The purpose of RITA was outlined by Rudhyar as having the eventual aim of establishing "a permanent center, where files of over 1,500 articles, manuscripts of unpublished volumes, paintings, and musical scores will be made available to students, and where courses and seminars will be organized. A complete edition of my writings may follow in order to keep them circulated, as commercial publishers will not keep books in print unless they sell almost as many copies as new releases each year . . . Other activities will develop as the need and possibility for them arises." Rudhyar peacefully passed beyond the domain of the living on 13 September 1985. Life's circumstances made it nearly impossible for Rudhyar to concentrate upon his musical production as he wanted to do; yet this fact is actually an essential part of the meaning of his whole life. Rudhyar is the antithesis of the "specialist" ideal so worshipped in our disintegrating society. He is the typical "generalist," as can be seen from the breadth of interests and understanding displayed in his major books, particularly The Planetarization of Consciousness and Rhythm of Wholeness. Rudhyar states, "I had to be a generalist, because of my inclusive grasp of historical as well as cosmic processes and my sense of personal responsibility to a global future for mankind. Such a global future, I feel, cannot be reached in a manner consonant with man's total possibilities of individual and collective development unless a fundamental change in consciousness and in the quality of social and interpersonal relationships takes place; and this very soon. Thus an essential and nearly total transformation of our civilization, a ‘revaluation of all values’ is urgently needed. It is not a matter of technical inventions or changes in social or artistic fashions, especially not in music as such, or any profession as such; everything is involved. What is most important therefore is to formulate in broad all-inclusive terms what the basic principles at the root of this total transformation are." This is what Rudhyar more than ever tried to do in his last books. Because of his enormous production of articles and books concerning astrology, Rudhyar naturally become known by many people as an "astrologer"; but he states he "always saw in astrology mostly a tool, a technique for the development of a ‘generalistic’ and humanistic type of understanding and wisdom, and the practical everyday application of a holistic and objective grasp of the very foundations of all existence." One of his early and unrealized projects had the motto: Solidarity, Service, Synthesis. It expresses the essential character of Rudhyar's life and work. Rudhyar had to wait until his seventies to see at least some of the ideas and ideals for which he has stood for fifty years taking roots in the minds and hearts of those who could be his grand-children. And as an octogenarian he experienced one of his most active and creative periods. He had the patience of men who know that their work is attuned to the rhythm of evolutionary forces that must eventually succeed, however long success is delayed. His also was the impatience of those who realize only too well the urgency and critical character of every moment of life at the threshold of what could be a deep and widespread upheaval of the most basic values which have pervaded our Western civilization, and indeed other cultures, whose flowering has long been past, and of which only spiritual seeds and memories remain. In days of often confused thinking and aimless living, Rudhyar had the rare characteristic of knowing where he stood and had few illusions concerning the road ahead. There is an inner knowledge that can only be suggested and evoked, and all that is said of the outer life is after all only an externalization of the power behind the personality. In the end, this only remains. The performer of the ritual of a creative and pioneering life gives up his "mask," for others to use when the need requires, and retires in the silence. Conditions after Rudhyar's passing in 1985 made it difficult to continue the work of RITA in a fruitful and sustained manner. During the latter part of Year 2000, however, Leyla Rudhyar Hill, Michael R. Meyer and others reactivated the Rudhyar Institute for Transpersonal Activity. Together they are working to make Rudhyar’s legacy available worldwide through the web publication of the Rudhyar Archives.